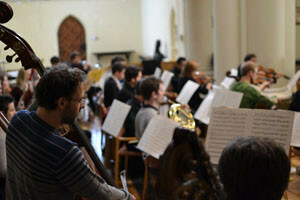 The OUTCRY ENSEMBLE is a chamber orchestra that draws together young professionals who are at the start of major international careers as orchestral, chamber and solo instrumentalists. Outcry is renowned for a pioneering approach to programming and performs either a world premiere or a work by a living composer at every concert. They approach modern music with the mixture of passion and rigour that you’d typically expect to experience in performances of mainstream repertoire, and apply the explorative-analytical approach normally found in contemporary music to their performances of the ‘standard’ repertoire. The Outcry Ensemble was founded in 2010 by music students at the University of Cambridge and is currently run by conductor James Henshaw. Since November 2011 the ensemble has taken up residency at St John’s Church in Notting Hill, who have greatly expanded their music programme. The ensemble is made up of outstanding young players, and aims to combine an exceptionally high standard of musicianship with a youthful energy. The ensemble also champions the work of young composers, including 2014 Borletti Buitoni Trust Award Winner Kate Whitley, and offers accessible programs of staple repertoire alongside innovative new works. Each program is designed with the presentation of new composition in mind, and the ensemble frequently premieres works that have been composed and orchestrated to fit within a particular program. This provides access to outstanding new music while also giving a new context in which to hear the existing works of the classical canon.